I had lots of spare apples on the small apple tree on the allotment. The tree was growing on the allotment when I took it over, so I'm not completely sure what type of apple tree it is, but I suspect it is a type of Golden Delicious. It bears small, golden yellow apples with a pink fleck to the skin, which is typical of this type of home grown apple, and nothing like the commercial variety. They taste pretty good and they also make great jelly. 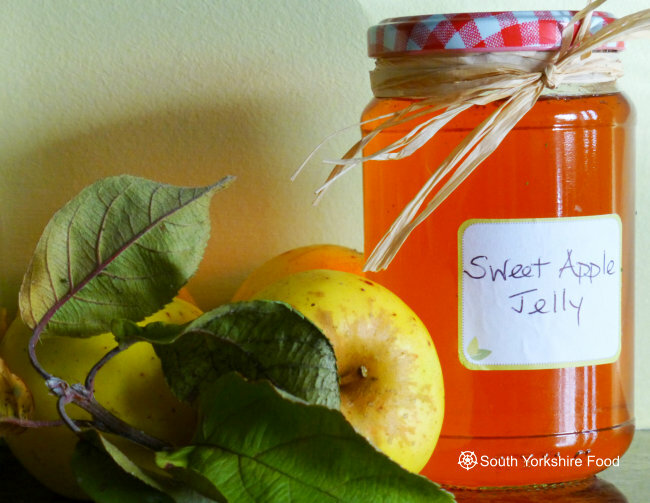 Two kilograms of fruit makes enough jelly to fill four 1lb/380ml jam jars. you will also need four or five warm sterilised jam jars, a jelly bag, a cold saucer in the fridge, and a jam/sugar thermometer, and a jam funnel if you have them. Now weigh the juice - I got 1.5Kg from 2Kg fruit. You have to match this with the same weight of sugar. Put the sugar and juice in a large sauce pan or jam pan, over a low heat. Now whilst stirring, heat the mixture until the sugar is melted and dissolved by the heat, and then bring slowly to a rolling boil.